One reader noted that the Higher Education institutional order pages for the iPad 2 are live. Now this doesn't actually let you (or anyone) order an iPad 2. You can create a proposal for your Apple Authorized Purchasing Agent. 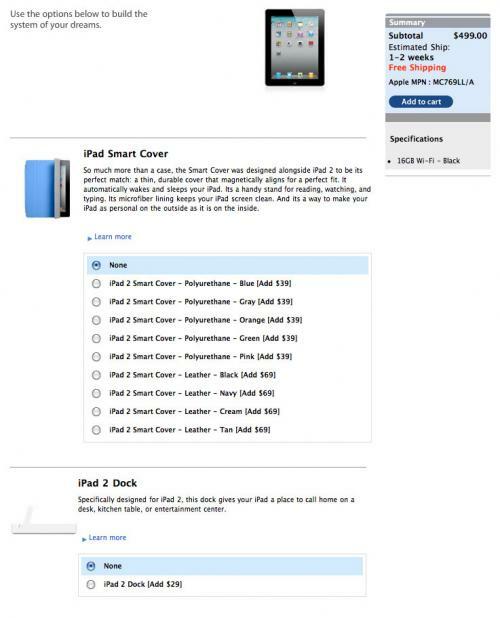 But it does show the iPad 2 with all different accessory options, in case you want to practice for 12:01am Friday, March 11th. As we had known, iPad 2 Smart Covers are $39, Leather ones $69. iPad 2 Dock is $29. The Digital AV Adapter is $39.